Rava idli recipe -Learn how to make rava idli most soft and easiest way and surprise you guests with homemade 1000 times better Rava idli, with full video, step by step pictures. Sorry for disappearing just like that for some days from blogging..I was out for a holiday trip with friends. From now I think I would be able to be regular like before. The same day only I bought a bottle of eno fruit salt,for trying dhoklas…. (okay,I had rava idli also in my back of my mind…I agree).And I made the mixture ready and was steaming and desperately waiting for the results…And when I sat down and took one piece in my hand,it was too soft and moist,and it just melted in my mouth!!! So here’s the recipe for you all who love to enjoy the spongy,moist,soft…… rava idli! Heat a kadai and add ghee and oil,splutter mustard and add the rest under To temper table.Then add the finely chopped ginger and chillies. ( you can grind ginger and green chillies and use the paste too). Then add the sooji with curry leaves and coriander leaves to it and fry in a low flame taking care to not to change the colour of rava. Heat the idly cooker with water and let it be just ready for steaming and grease the idly plates with ghee/oil. Your spongy,moist,soft rava idlies are ready now! Garnish if desired and Serve with coconut chutney or your choice of chutney!!! If you want to decorate the rava idli,you can first add little,little carrot,coconut gratings (You can keep a fried cashew nut also) in the mould and pour the batter over it. Eno salt is very very important ingredient,so make sure you don’t omit it,and should be a active one i.e; if you add it to the battter,you should be getting bubbles. You can add green peas along while frying ginger green chillies. These Idlies stay soft till you eat…i.e; for long time,so you can make it for your guests and keep,no worries…it will be soft as when you take out from the idly mould!! Any doubts,feel free to ask me,I am here to help you out to get a perfect idly!! I assure you 🙂 And now coming to the exciting moments to share with you all…! My blog has been featured in Times Of India(New Delhi edition),Friday supplementary What’s Hot,Blog-e-binge, section on February last week Friday edition!! Hurray! ! Here’s a screen shot!! congratulations Raks for 3 great news…. 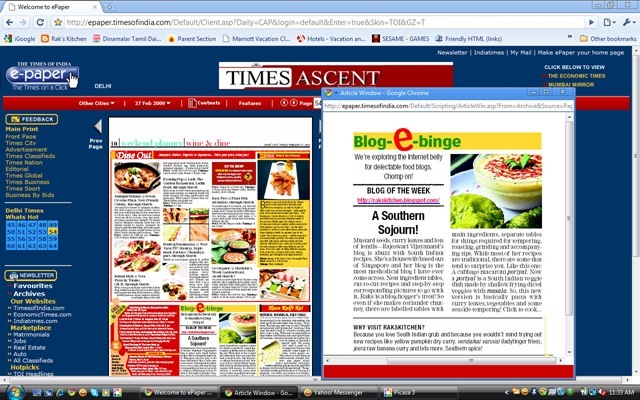 for your article being published on newspaper, for winning nag’s event… and thirdly for getting perfect rava idlis!! hats off to u.
Congratulations on ur award and also being featured in the newspaper.Am so happy for u! wish u lots of success in all ur future venture too! Rava idli’s look so soft and perfect. Congratulations Raks For all ur achivements. Lovely pics of rava idlies. Hope u had a nice trip. Congratulations on all your achievements! wow! great that u got featured in times..Great news! nice recipe! idly looks lovely! Congrats and great to see u back, I use eno to rava idlies too! They look great. pics look awesome and is making me hungry in the middle of the night!! Congrats on your win and also for the article. Wonderful! Welcome back dear..hope you had nice trip and enjoyed it….did you got the earnings ;)?? Okie am a fan of rava idlies..and this looks so perfect…let me try once I get eno….wonderful pics as usual…Congrats dear…it’s so gud that your recipes got feature…cool dear..
Rajeswari, the rawa idli is just so delectably appealing! Heart-felt CONGRATS…1. Being featured on prestigious Times Assent! 3. Being accessible to all fellow foodies with your brilliant posts, organised directions! 😀 Hugs to you, feeling so proud of you! congratulations for the prize & also for being featured in TOI. Congratulations,Raks..Its nice to hear those good news. My hearty congratulations on ur award :)Idlies looks spongy and soft,i can feel the taste here!!! Congragulations a real wonderful achievment. The idlies look reall fluffy and yumm. Your idlis look simply amazing, R! Congratulations, Rak. And those idlis, by the way, look perfect. Good to see u back..Congratulations for that wonderful news..Hooray..Perfect fluffy idlis..Lovely pics .. I also never get perfect rava idlis. I like the idea of adding fruit salt. Bookmarked to try. Idlis have come out so soft and gorgeous! Congrats on all the great news. You deserve it! I am so happy for you! It was a pleasure reading this post filled with happiness all over. Congrats for the mention in TOI,for the prize and getting the softest rava idlis. Great click and idlis look perfect. rava idlis looks so soft ..great picture..congrats on the news..lovely..
congratulations for the mention and your rava idlis look perfect ; nice clicks! congrats dear. thats a great news. Rava idly .. well explained and usage of eno seems good idea. I do it in a different way. just add a cup of old dosa batter and ferment it for 4 hours to get a fluffy one. But urs seem so easy and delicious.Yummy. We love rava idlis too but have not used eno before… I can see that it has worked out really well. Wow! That’s Gr8..Congratulations on ur award and also being featured in the newspaper..Rava idli’s look so soft and perfect. Wow.. thats a gr8 win!! Its like flying high in joy, rite! U deserve them all. I’m drooling over your Rava idlis.. me too a fan of MTR rava idlis! Will try your’s soon. Bookmarked! hi, great news, congrats for all the awards & article published on newspaper! !, u deserve it, ur photography is awesome…, The idlis have really come out very well can be seen through ur pictures…hats of to u for everything…., happy blogging and post more recipes too…very happy for u as ur such a lovely person. Look at you teasing us with those perfect idilies! Congrats on the TOI mention! wow congrats…so happy for you gurl! Eno does the magic with the idlis….great click. i made rock-hard rava idlies recently. 🙂 will try this next. Idlies come out pluffy. and great pics. I tried your rava idlis (didn’t have eno salt but did them with baking powder) it came out good; going to post them soon! thank you for this delicious recipe! Congrats! Looks great, soft n yummy! Sailaja and revathi, Eno is the thing that makes the idly fluffy and soft,it is a must, other wise it may turn hard…. just realized from the above comments that alka has used baking powder,try that and see! Or else try adding soda water(plain soda) instead of plain water and see! hey rak's…..i like your recipes a lot…..u tend to make them so easy to prepare…….n congratulations……. Yes you can use baking soda. For 1 cup rava, you can use 1/2 to 3/4 tsp. I tried this Rava Idly(with eno salt) it came out so soft n delicious…will be posting it soon :)Thanks for this great recipe! Hi Raks, just came to check on the rava idli recipe; I like the combinations. I was wondering if one could make idli's without the tadka? Hi Raks!!! !I tried this RAva idli it came well and yummy but it was too hard.. I didnt out Eno fruit salt cos it wont able at our place. So please for softness what i can add? Eno is for making the idli soft, if not try adding 1/2 tsp cooking soda… try again and let me know.. I was earlier very much uninterested in cooking but my partner really likes to gorge on, he likes to eat and taste varities of stuff. We both are vegetarian. I am really thankful to you and your blog for helping me enlighten my culinary ideas and train my skills. Being a north Indian, I found it very helpful as you have shown step by step processes with photographs. I have always wanted to make Rava idlis ever since I ate it the first time… Thanks to your blog, I made some really yummy, soft and utterly tasty Rava idlis for breakfast today. Also I accompanied it with Corriander-coconut chutney. It tasted heavenly. Thank you so much… You made my day!!!! Hi Raks, thanks for this fabulous blog. I tried the rava idli recipe your rava idli recipe and they tasted good but the urad dal and chana dal were still raw even after steaming the idlis. Do you know where I could have gone wrong? Thanks! I tried your rava idli recipe today. Came out very well. Great recipe. Is there a substitute for ENO salt? Would baking soda be ok? if yes, how much do you think i can add to get soft idlis? hai raks what a wonderful person u r? i always phoned my mom how do this but now u saved my time &money.wwwwwwwoooooooooooooooo .super ya. Tried ur rava idly… It was a success…. this is de 1st time i got fluffy rava idlys… Texture was awesome.. thanx a ton..
for the last one week i have been in browsing ur website.. though many of them would have told u abt wht i am going to tell u now.. yes it is awesome.. i liked the way ur receipes r presented.. hats off.. keep continuing this good work.. I have been search for a perfect rawa idli recipe for a long time. I am sure I found one now. Thank you soooooooo much. Wow.. I do make rava Idlies but ofcourse without ENO Salt 🙂 Will try this one for the fluffiness. Every time I made rava idli they were horrible, so I left making them. Few days back when I saw this recipe in your blog I thought of trying this and they came out superb. Very rarly my husband compliment on my cooking. But after tasting these idlis he said double superb they taste as it is made in restro. I am very thankful to you for posting this recipe. hey raks.. i tried ur reciepe today & idlies came out perfectly… thanks a lot..
Hi, wat do u mean by eno??? the one that we use for gastric troubles??? It looks like you have added more eno. Next time try adding a little less. Or give 2 mins standing time b4 u take the idlies from idli plate. Grease the spoon u use to take idli every time you take the idli. thank u so much for the rava idly . it will come out awesome for first time. u r rocking raaji!!!!!!!! Tried ur recipe for breakfast today. Came out very well. My family n friends at work liked it. Thanks a lot for the recipe. Hi yesterday i prepared rava idli, it was nice but little bit hard…. i did't add water…. May be the batter was too thick? Also make sure eno is active. came out great for me here in Boston! Came out great for me here in Boston — would you believe it I have told my mom (the expert on all food South Indian) to try it. Now a days I m so confident about my cooking. Ur blog helps me a lot and makes all wife's and Mom's as best chef in their family in their own way. To be honest i credit your blog to everyone who applaud me :). Well i m residing in UK and have been in search of eno fuit salt every were. I have the blue one of eno salt – does that help in preparing rava idly ? If not can i use baking soda ? Hey Raks, thanks for posting this. I really want to give this a try as son only eats soft things? Can these be eaten alone? Any possibility with out using eno. Hi rak. I made this today.. but it came out flat n kinda soggy. Too much water or too little eno? Thanks for posting this recipe! I made rava idly for the first time ever for my South Indian husband and he absolutely loved them. He said that it tasted better than even his mom's rava idlies and then ate almost all of them. I'm bookmarking this recipe for sure – thanks so much for sharing! Thank you once again and Regards. Thanks for your important tip, ie adding Eno fruit salt. We prepared it at home two three times and it came out exactly, like the Rava idlis we get in Hotels. This is the first recipe I tried from yr website ! It was delicious ! Thanks for sharing ! ..I used idli sooji..is that the mistake? If the batter drips in the boiling water inside the steamer, sure this will happen, so avoid the raw batter dropping inside the steamer. 5 stars for this recipe. I've never tasted rava idli in my whole life. So I didn't know what to expect but my husband whose a food lover kept complimenting until he finished. And when I ate the idlis, I knew this recipe is to be saved for a lifetime. I'll be doubling the ingredients as this was not enough for all of us. Hi Raks, what do you mean by eno fruit salt. Please explain. Its like a dry form of plain soda. Its available in shops. When you add it to the recipe, it froths and gives soft texture. Do we have to use coarse Rava or fine rava for this idly? Which one will.come out good? Hai raks,Thanks a lot for all the superb mouth watering dishes you have posted.I understood that ur a perfectionist in cooking.Hats off.Thanks for sharing your recipes.U made me love cooking and feel more confident about the outcome of the dishes i make.Thanks dear. Eno should bubble and it makes it frothy. This will give spongy idlis. U should make it immediately as you add eno. If it becomes watery, add more rawa and eno. Can I use yeast instead of Eno? It helps the eno to work better. If you want reduce the amount you add. for how many days i can store the left over batter in fridge???? Shld I use up a rava or suji rava? What is eno salt ?? If it's not there what to do?? Its a combination of baking powder and citric acid. So if you do not have, replace with baking powder (1/2 – 3/4 tsp). Make sure to use lemon juice as well. Can I use baking soda instead of eno salt? Hi mam, I am amateur cook residing in UAE.I am a great follower of yours cause there none to teach on cooking here. Is it healthy to add Eno in cooking. As I don't know exactly and what side dish combination will be best suited for this dish other than Coconut chutney. Yes once, in a while it's okay and other than coconut chutney, sambar will be good. could u pls say how many idlis we wil be getting for this recipe? I have tried this recipe and d taste comes out well. But idli is hard. Hi Raji…can i use idli rava instead of mormal rava? Hi raji… tried the idli today. It was awesome… flawless… and yummy. Love ur blog. I have orange flavoured eno salt.. Can I use it? I tried it and it came out very well.. thanks for the recipe.. one doubt.. why to add lemon juice? I used the eno active one only. And the curd water proportion I used the same.. I didn't use more water than mentioned.. Still it came hard… What could be the reason? ?